You know what I don't feel good about? The Body Fat Composition I just had done at work that told me I am 1/3 body fat!! How gross is that? I went and ate some chocolate to console myself. The only reason I subjected myself to the health screening (which also told me I was overweight according to my BMI) was to be entered in a raffle for a Fitbit Flex, and I won! Phil and I already wear these Fitbits every day, but now JP will be getting a nice gift for his 14th bday! So I guess the humiliation was worth it. After that screening I decided to join Weight Watchers. Again. I had much success with the plan about 7 years ago, right before Maggie turned two. I lost 20 pounds, trained for my first half-marathon, and just got in really great shape. I remember always being hungry though, and I've never had success with the plan again in reaching my goal weight. But I *think* it might stick this time. I have a cholesterol check at the end of January, and a physical sometime after that, so I would love to get my body back to optimal health. It requires will power and I'm gonna have to dig deep to find some. Their new app makes it so easy to track food, and my Fitbit syncs with the app to calculate my activity points! Speaking of apps, do you guys use the Walmart app? I was a big fan of the Target Cartwheel app to save money, but with the Walmart one, you just buy your junk and then scan the receipt. The app searches to see if there are any lower prices of what you just bought in the area, and gives you back the difference in price. I always get a few bucks back, fun! Tomorrow night, my book club is having their annual Christmas party. I'm like the worst book club member because I can only go in the summer, and even then I barely read the books...but I like the parties ;) I'm bringing these yummy desserts - try them for the holidays, people go nuts over them! 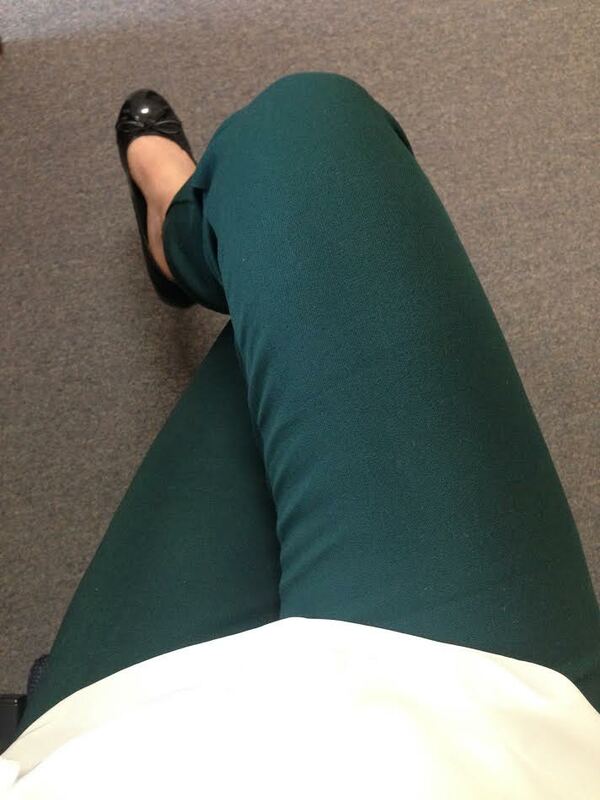 The other day I wore my green pants and a white blouse to work, and got so many compliments on the pants (very holidayesque) that I thought I'd share. They're winter spruce pixie pants from Old Navy and I order them in tall to reach my ankles perfectly (I'm 5'6"). Twice this week I realized how small the world is. Once was when I realized a mom I'd been following on Instagram for awhile had dated my cousin 12 years ago! Then I called the police station to talk about giving a donation from work, and the person who answered was a friend I'd made also 12 years ago in a mommy and me group. Things like this always remind me that we are all intertwined, and bring forth the reality of the communion of saints. So cool! Have a great swimming lesson viewing, basketball playing, football watching, book club partying kind of weekend everybody! 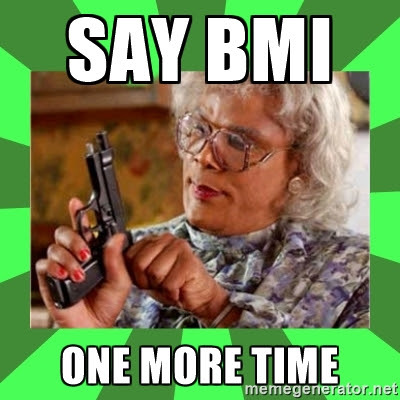 That BMI stuff is bogus. Look at those skinny legs! I'm 🍎 Shaped, but thank you! I make those cookies except I use peanut butter cookie dough. I guess I just want to look good for my age, and not for the number of kids I had. Like, I look good for having seven but not if I had three?!?? I kinda think there's a prebaby body and a postbaby body but it shouldn't matter how many I've had. Maybe I'm too hard in myself, but then again, ALL the numbers say I need to lose weight: BMI, weight, body fat composition, cholesterol levels, and waist circumference. Yes way to hard and it does matter how many--the more--the harder it is to reach those #s on a chart. Just work towards feeling your best! :/, to the chart. Your body also hangs onto fat while breastfeeding. Many women find that they can't lost that last bit of baby weight until after weaning or after their cycles return. So, if you are breastfeeding, and especially if fertility hasn't returned yet, you are more likely to hang onto a little bit of extra fat until those milestones happen.